Even if it is well known for its historical past and the dark Nazi period, Nuremberg has managed to develop due to its key position, and is now the second largest city in Bavaria, after Munich. If you chose it as the destination for your holiday, you are likely to be surprised of the qualitative services you will receive here and also of the numerous Nürnberg hotels, ready to host thousands of tourists from all around the world. Most people decide to come here during winter, and for good reason, if you take into consideration the fact that the local Christmas market is one of the most famous in the world. 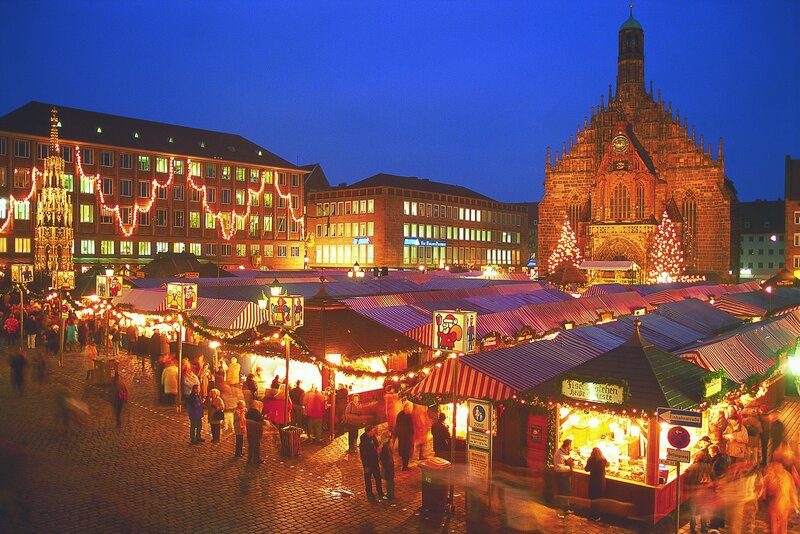 The Christkindlesmarkt’s atmosphere describes perfectly the holiday spirit: excited anticipation, peace and joy. The market is open annually on the Friday before the Sunday before Christmas, and the event is announced through an ample ceremony taking place outdoors in the main Square. The opening ceremony has not been changed for decades, and each year, thousands of people from various places of the Globe expect eagerly the words from the market opening. The “agenda” of the event has not changed, but the text of the prologue has been rewritten several times since 1950, when the initial form (by Friedrich Bröger) first appeared. Regardless the age, people are caught by the holiday spirit due to the variety of colours and lights displayed at the market. After wondering only for a short period of time on the paths of the Christkindlesmarkt, you will be fascinated by the peaceful and festive atmosphere. Having hundreds of years of tradition, the market is an event the locals take a lot of pride in. For this reason, as soon as December arrives, you will barely find a house without lights or traditional adornments, because all the locals support the Christmas spirit as good as they can. There are so many things to enjoy at the local market, that you are likely to need more than one day to try them all: foods, drinks or sweets, these will all enchant you and it is a pity if you miss any of those. The traditional Nuremberg sausages can be found on all the booths, while the famous gingerbread, with a tradition of more than 600 years, can be purchased in almost any form, size or assortment: chocolate, sugar, strawberries and many others! Besides tasting one of each, these small desserts packed din nice seasonal paper will make the perfect souvenir for your dear ones. In terms of souvenirs, the offer is extremely varied, and you can find gifts from all over the world, due to the international merchants who come here each year. The Market of the Sister Cities can be found right next to the Christmas market, and whether you want to buy a Scottish kilt or a French cheese, this is the place where you should be looking. Of course, here are the most beautiful and innovative Christmas decorations, and the crafted items represent the most sold things from the market.